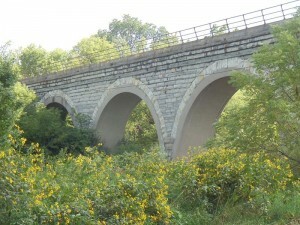 This graceful, beautiful railroad crossing over Turtle Creek in rural Rock County just might be the oldest stone arch bridge in Wisconsin. Built in 1869, Union Pacific Railroad still uses the bridge on one of its main lines between Chicago and Madison. 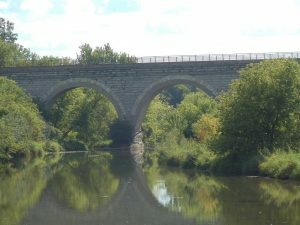 The bridge is 387 feet long and was added to the National Register of Historic Places in 1982. 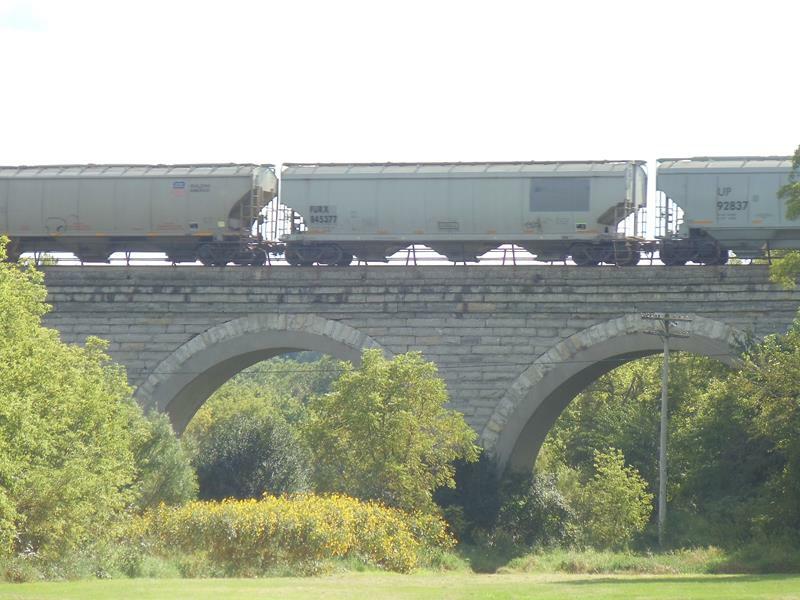 When the bridge was originally built, train locomotives weighed much less; about 43 tons (yes, that’s still heavy!). But today, locomotives can weigh upwards of 250 tons. The bridge was reinforced in the 1930s and have concrete rings to help deal with today’s weights, but the original architectural splendor remains quite intact. While admiring the bridge, it takes little time to experience the rumble of the trains crossing; this is a busy line! You’ll find the Tiffany Stone Arch Bridge in the Town of Turtle, near Shopiere, in Rock County northeast of Beloit. Rock County maintains parkland around the bridge, so feel free to run around and explore. The best way to access the bridge is via Shopiere Road/County J (Exit 183) off I-39/90, heading northeast about five miles from the freeway. From I-43, you can exit Highway 140 (Exit 6) and head north a little over two miles; just over Turtle Creek, turn left onto Creek Road and follow it to the bridge area.